Xerocomus subtomentosus (L.: Fr.) Quél. Cap up to 12 cm, at first hemispherical, later convex to flattened, colour very variable, yellowish ochraceous, ochraceous, sometimes with olivaceous tint, becoming pale to dark brown or brick coloured, sometimes bright yellow or red, dry, felty, later smooth, sometimes cracking and yellowish or whitish flesh is then seen in the cracks. Stipe cylindrical, spindle-shaped to almost club-shaped, often tapered towards the base, pale yellow or yellow, downwards sometimes becoming brownish, sometimes striate, often covered with scattered fine brownish, pinkish or reddish granules, sometimes forming dotted network, unchanging when bruised; basal mycelium whitish. 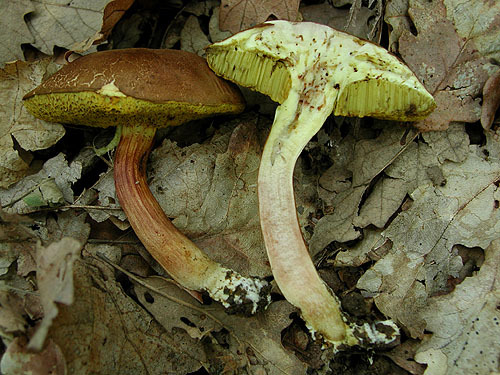 Tubes pale yellow to yellow, more olivaceous with age, faintly blueing or not blueing when injured. Pores concolorous with the tubes, blueing when bruised. 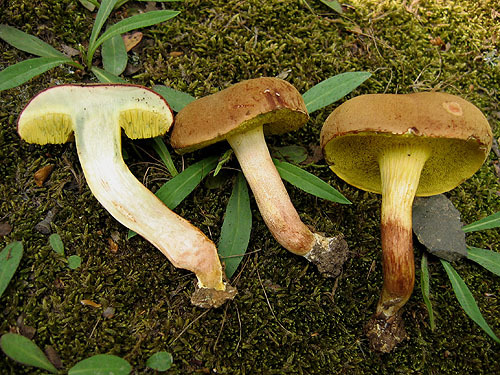 Flesh whitish or yellowish in the cap and in the stipe, pinkish or pinkish brown in the lower parts of the stipe, blueing faintly in the cap or not blueing at all when exposed to air. Smell somewhat acid. Taste acid. 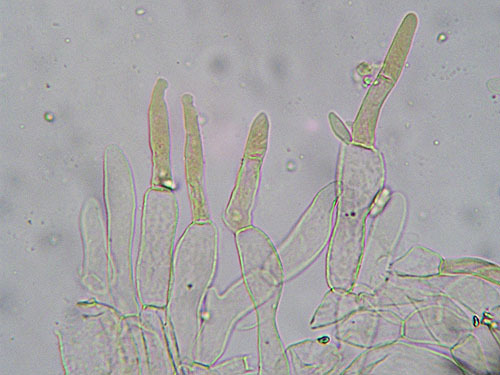 Spores 10–15 × 4–6 μm, smooth. Pileipellis palisadoderm of septate hyphae of cylindrical, smooth or nearly smooth cells. Habitat. Mainly in broadleaf or mixed forests, or in parkland, mycorrhizal mostly with with oaks (Quercus), but also with beech (Fagus), hornbeam (Carpinus) or birch (Betula). Distribution. 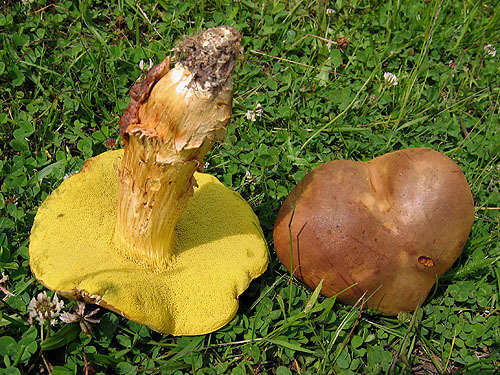 In Europe widespread, but out of any doubt in the past confused with Xerocomus ferrugineus. Similarity. 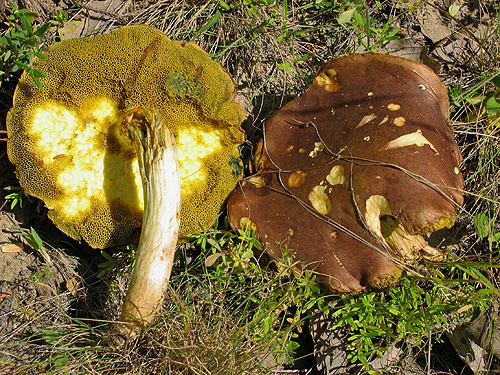 Xerocomus subtomentosus is most similar to Xerocomus ferrugineus, but the later has whitish (including in the stipe base) and unchanging flesh, yellow basal mycelium and is found mostly under conifers. Forms of Xerocomus subtomentosus with red-coloured caps might be confused with the reddish coloured species around Xerocomus rubellus, but again, the pinkish or pinkish brown flesh in the stipe base, together with the weakly incrusted or not incrusted cells of the cap cuticle, are usually easily setting Xerocomus subtomentosus apart. Xerocomus silwoodensis, a reddish or reddish brown coloured ally of Xerocomus subtomentosus is distinguished by the whitish flesh (incl. 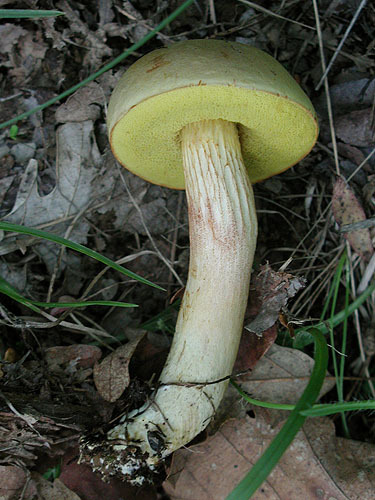 the stipe base) that becomes somewhat yellowish when exposed to air. 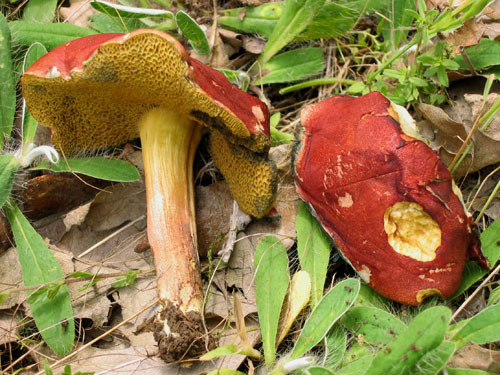 The recently described Xerocomus chrysonemus is another similar entity. 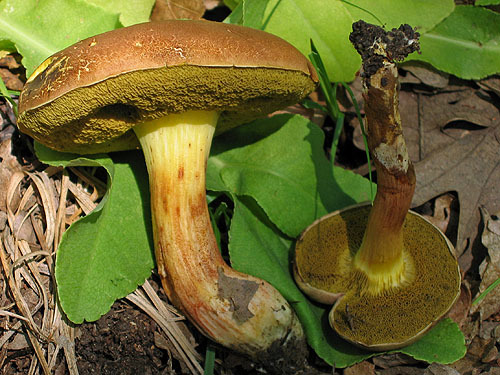 From X. subtomentosus it is distinguished by the bright yellow (not pinkish or brownish) flesh in the stipe base that is usually not changing when exposed to air (instead of the flesh of X. subtomentosus that is normally blueing in the cap). 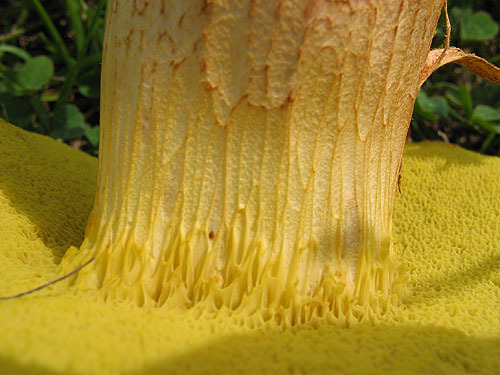 Also the basal mycelium is yellow to bright yellow (whitish in X. subtomentosus).